Here are photos from Domain.com’s party in Austin Saturday night and the .CO HQ. Domain.com threw a party in conjunction with Public Interest Registry (PIR) Saturday night in Austin at the SXSW festival. A steady cold rain didn’t keep people away. In fact, it may have drawn them to the relative comfort and warmth of dancing in a tent. For the second year in a row the party featured 80s cover band The Spazmatics. Drinks included “The Domain Fire” and the “Refresh-ORG”. 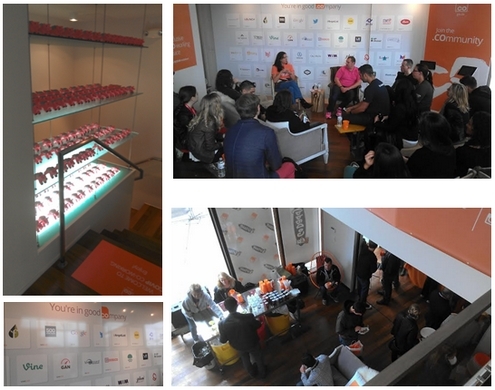 On the other side of downtown, .CO had a continuously packed house at its pop-up HQ in a storefront attached to the W Hotel. The .CO HQ was open from Friday through Sunday and featured visits by John Battelle, Gary Vaynerchuk, and .co users Backplane and DJ Skee. 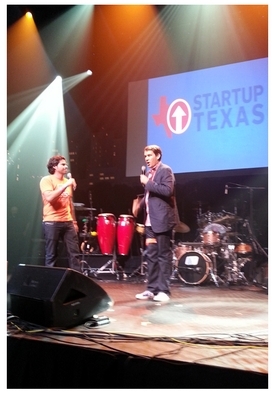 SXSW 2013 attracted a handful of domain companies, and I expect more next year. .Co founder Juan Diego Calle on stage with Steve Case. 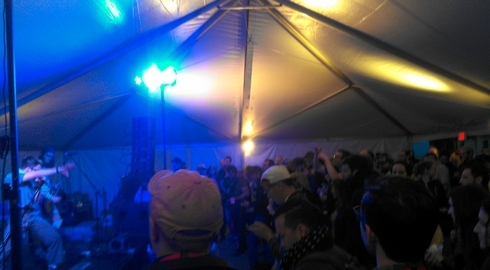 SXSW 2013 is over, and what an event it was. The Interactive portion drew over 30,000 official attendees. Add in the “shadow” (i.e. unpaid) attendance, and it probably topped 40,000 people. SXSW Interactive attracts developers, tech startups, app companies, graphic designers, and other people who like to wear thick rimmed glasses. 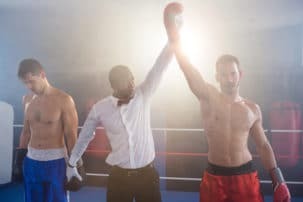 It’s a ripe audience for domain companies since just about everyone in attendance has registered a domain at some point — and certainly will register more domains in the future. That’s why domain companies have taken an interest in the show. It gives them a chance to interact with end users that register domains for their businesses. .Co has been at the conference for three years running, and each year it has a bigger presence than the last. This year it offered VIP perks to over 70 startups that use .co for their domain. Domain.com pulled out the stops this year as well. It sponsored a party and had a booth at the tradeshow. .Org and .me also had booths at the tradeshow, which is open not just to Interactive attendees, but also Film and Music. The Domain.com booth with its Twitter powered candy machine. Based on the brief conversation I had with one of the exhibiting companies, the Film and Music attendees are just as much a prospect as the Interactive ones. Which leads me to this prediction: next year there will be a lot more domain companies at the conference because this is a great event at which to pitch “new” top level domains. Will we see .music here next year? Although it’s truly the perfect conference to market .music, I doubt that one is resolved by this time next year. But I’d be surprised if Demand Media — which has offices in Austin — doesn’t show up in 2014. SXSW just screams out for .ninja domains. It also makes sense for many of the other TLD hopefuls that want to make a big name for themselves. All of which leads me to believe that you won’t be able to turn the corner at SXSW 2014 without bumping into a domain company. Three domain companies and events to hit while in Austin. SXSW Interactive in Austin is an overwhelming event. There are hundreds of sessions to choose from, and just finding their locations can be a challenge. So let me break down for you some essentials for SXSW Interactive 2013 if you’re in the domain business. .Co is going big at SXSW once again. I don’t know their full schedule, but one event they’re sponsoring is Tech Cocktail’s SXSW Startup Celebration. You can get your free ticket here. The event is Saturday, March 9 at 7 pm. If you have a business running on a .co, I’d follow them on Twitter to learn about where they’ll be and get hooked up. Domain.com is sponsoring The Brush Square Bash & Lounge on Saturday from 4-9. Free booze, free BBQ, and The Spazmatics. Here’s how you can get VIP access to the party. The company will also have a booth at the tradeshow. Sedo is getting another 15 minutes of fame (literally, 15 minutes) again this year. Sedo general counsel Jeremiah Johnston will present a “Future 15” titled “New Domains Have Landed: Now What!?“. Last year’s Future 15 talks were south of the river; this year Johnston will be speaking in the thick of it at the Hilton next to the convention center. You’ll be amazed at all the free stuff you can get just by walking around downtown during SXSW. Honestly, it’s a good way to soak it all in. I also recommend checking out the SXSW Comedy events for which your interactive badge gives you access. If you swing by Esther’s Follies most nights there will be some sort of comedy event going on.